Tea is best when enjoyed with others. The more tea I drink the more I’m convinced this is true. I highly recommend finding some people to drink tea with if you’ve never experienced it before. The social aspect of tea makes the whole thing way more enjoyable. In fact, I encourage you to go one step further and start making tea for others. This is especially helpful when you can’t find anyone around you who enjoys tea as much as you do. I don’t know many people who would turn down some free tea! You learn more about tea by sharing it with others than you do by drinking it alone. You are literally nourishing the people you serve tea to. You are developing empathy and humility by serving others. You get to see other people experience your favorite teas. You can improve your tea brewing technique. You can help others discover the joy of loose leaf tea. You have an excuse to buy more tea! Hearing others’ experience with a tea I’m familiar with is always enlightening. You are nourishing the people you serve tea to. Tea is good for you, generally speaking, so when you serve teas to others, you are actually nourishing their bodies and helping them live a healthier life. There are few things in life you can do to help people like that! A selfish person cannot truly serve others; they can only serve themselves. You must be truly humble to serve. I believe you must have empathy to for your guests to be able to genuinely serve them. Love, grace, and patience are also required to serve others (ask anyone who’s worked in the service industry), and you can cultivate those traits in yourself when you make tea for others. Everybody experiences tea in their own unique way, so watching and listening as others drink your tea can teach you something new. I saw this happen first hand when my friend Anna and I made tea together a while back. 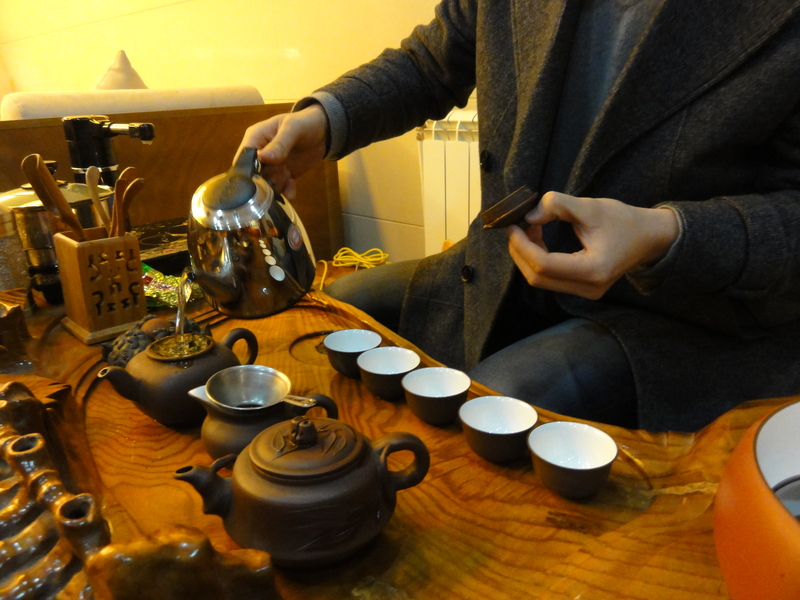 I believe gongfu style tea is the best approach for serving tea to others. Maybe you’re more into the Japanese tea ceremony (chado). Either way, making and serving good tea is a skill that can be improved and refined through practice. What better way to improve your brewing technique than making tea for friends and loved ones? Most people are either unaware of the awesomeness of loose leaf tea or interested but unsure how to start. You can be the sheperd that starts them on their journey to better tea. Since I’ve started writing about tea, I’ve had a number of my friends either show interest in tea or come to me directly with questions about getting into tea. I’m always happy to answer their questions because I love tea and I love sharing my joy with others. You know you want to buy more tea. The more you serve tea to others, the faster you run out. The faster you run out of tea, the more tea you can buy! Okay, this is a bit of a blessing and a curse. But maybe you’ll have a bunch of new friends to split costs with when you make your next huge order from overseas! What do you love about making tea for others? Have experience brewing for others? What are some of your favorite things about it? I’d love to hear your stories and experiences. Leave me a comment down below!